The Public Improvement District will provide funding through a special assessment against property within the district for the following improvements and special services: repairing and maintaining existing landscaping, fencing and lighting; future parks and landscaped entryways; restoration or installation of irrigation systems in public rights-of-way; erection of new fencing; and supplemental services, operating expenses and costs of administration. The estimated cost of maintenance and improvements of the District for fiscal year 2016-2017 is anticipated to be $120,800. A map that specifically identifies the area is on file at the office of the City Secretary at the Cedar Hill Government Center. 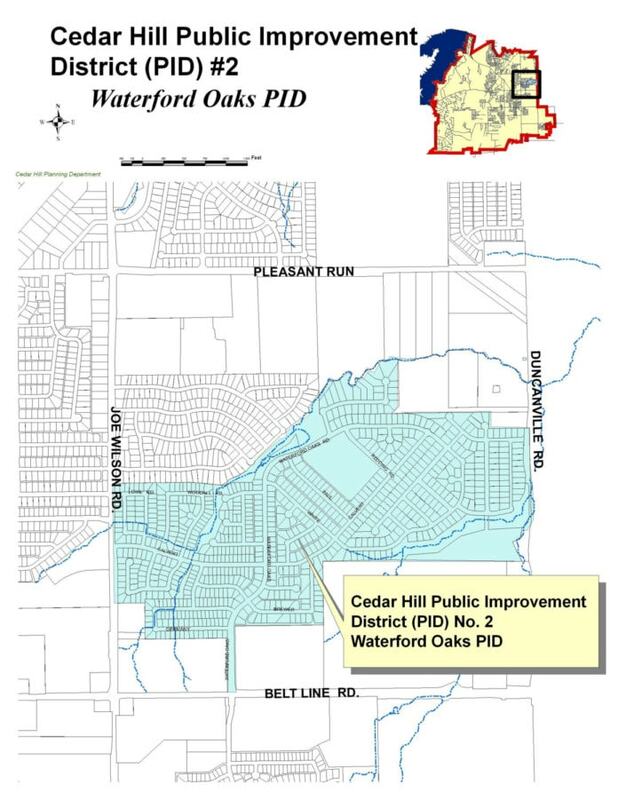 The area included within the proposed Public Improvement District is generally known as the Waterford Oaks Development. Annual cost of the improvements and special services will be assessed against real property within the District based on the taxable appraised value of each property within the public improvement district as established by the current tax roll of the Dallas Central Appraisal District. The assessment rate for the District, to be considered by the City Council, is proposed to be $0.10 per $100 of the taxable appraised value of the real property within the District. An assessment roll stating the assessment against each parcel of land in the district shall be on file for public inspection at the office of the City Secretary at the Cedar Hill Government Center, 285 Uptown Boulevard, Cedar Hill, Texas on or before September 1, 2016. A five-year service plan will be adopted by the City Council and will define the nature and projected cost of the improvements to be funded by the assessment until the year 2021. The cost of improvements and special services will be assessed totally against properties within the district, and no costs of the improvements and special services will be borne by the City. The City, however, will continue to provide services to properties within the district, including repairs and maintenance costs, at current levels of service. Citizens may present written or oral objections at the Public Hearing. The Public Hearing is not limited to those persons that reside within the Waterford Oaks area.